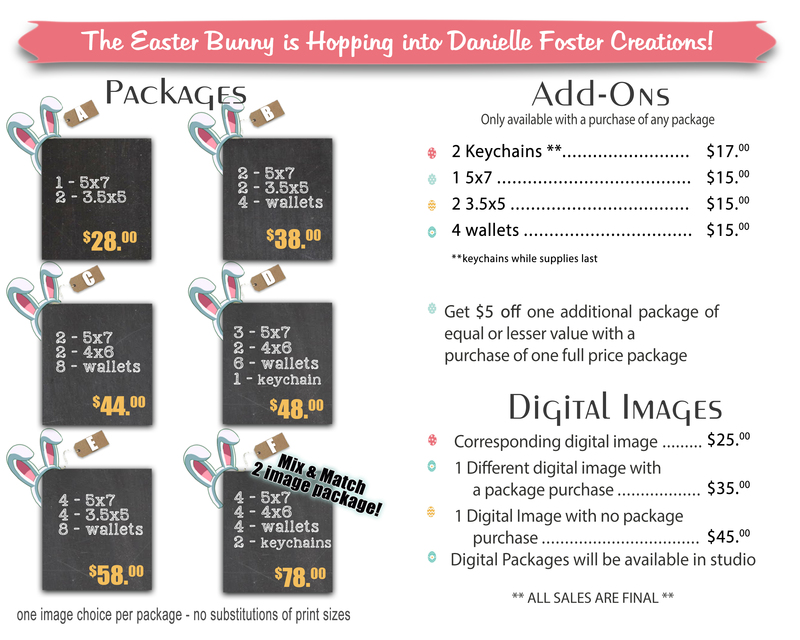 Hi there and welcome to Danielle Foster Creations' Easter Bunny Experience! Below will answer many of your questions before signing up! Consider your child's nap/bedtime when choosing your time. This is a VERY popular event and we want as many families as possible to get an appointment. We will delete any multiple appointments unless we have discussed any special circumstances. You will see these two locations at your sign up. This just determines what entrance you will use when you arrive. The Side Entrance is just to the right of the well on the side of the building. The Rear Entrance is behind the stairs at the back of the building. Do your best to keep your appointment time. We have sold out every year with very little cancellations, so rescheduling will be difficult as the holidays approach. It is encouraged that you sign up for an account when signing up for an appointment so you can manage your appointment (this is different than your DFC account). Select which Easter Bunny you would like to visit. Please do not select a Sensory or Dog Night or a Baby Day just to get in. These are specific to our guests that fit their description. Make sure you get a confirmation email! You only need one appointment per family - not one for the group shot. For example: If you are bringing your 2 children and your sister is bringing her 2 children. You will make 2 appointments not 3. Please note in the comments that you are getting a group shot and the name of the family you are getting it with. A specialty event for you to bring your dog and family to photograph together. Dogs are only permitted to this event. A wonderful night set aside for families who have children with sensory or special needs. Including premature infants and children with auto immune disorders. A day set aside for families with children 3 and under. If you have a children 3 and under you do NOT have to sign up here. This is just another option for you. Children ages 10 months-3 years tend to need a little more time to warm up and this day offers a little more time to do that.